An international line up of live audiovisual improvisations producing tangible sound and visceral vision, corporeal signals and audience interference. Austrian video artist Michaela Grill (laptop) together with Canadian filmmaker Karl Lemieux (16mm film projectors) and British turntablist Philip Jeck (turntables), will present a unique and improvised audio-visual performance in which image and sound, analog and digital elements are synergistically interwoven. An atmospherically dense articulation of the aural and visual/visceral, the Jeck-Grill-Lemiuex trio electrify the subliminal and the material in an outpouring which blends together the key components of their individual artistic oeuvre. Philip Jeck is most known for his contributions eliciting “ghostly bricolage, looped drones, surface noise and gossamer rhythms of pulsating hiss (The Wire)”. His record compositions have taken the form of up to 180 record players and records – his live shows a mass of interlocking grooved noises and disrupted sequences. Jeck won the 1993 Time Out Performance Award for his most famous work Vinyl Requiem, and his work has also featured at Sonic Boom at The Hayward Gallery, and The Prix Ars Electronica. He has released extensively on the Touch label and collaborated with Gavin Bryars, Otomo Yoshihide and Jaki Liebezeit, amongst others. Michaela Grill is a Viennese based moving image artist who has been making waves with her body of film and video work, sound installations and live visuals since 1995. Distributed by Sixpack Film (Vienna) and Light Cone (Paris), Grill’s work is prevalent on the European festival circuit and mixes digital abstraction and modulation in dialogue with its celluloid cousin. Karl Lemieux is an electric presence on Montreal’s experimental film scene, constantly evolving sonic collaborations and new film/light works since 2004. Lemieux began an ongoing series of performances with the musician Radwan Moumneh (Jerusalem In My Heart) in 2006, that brought Lemieux’s cameraless filmmaking techniques into the live arena. Lemieux reworks filmed images with various chemicals, paint and razor blades – breaking the images into their most basic (molecular) components and give birth to eerily illuminated “landscapes”. Orchestrating an assortment of hand-processed 16mm film loops through a suite of 16mm Eikis, Lemieux bleaches and paints filmstrips seconds before they hit the gate. Lemieux has has worked with an arsenal of musicians including David Bryant, Roger Tellier-Craig, Efrim Menuck and Thierry Amar from Godspeed you ! black emperor, Jerusalem in my heart, Shalabi Effect, Elizabeth Anka Vajagic, Jonathan Parant, Alexandre St-Onge, Christof Migone, Thomas Ankersmit and Kevin Doria from Growing. #2.06 is the title of the set which is the unusual pairing of French born, Berlin based Guillaume Calleau’s live super 8 film projections with Slovenian born, Berlin based Jan Slak’s solo drums – a stark, punk statement in expanded cinema. Described as “tangible sound, beating under the skin, wrapped into an envelope of stereo film projection” the solo soundtrack allows the changing hue and intensity of the colour flicker film projection to transcend into a different space/time. Consisting of two super-8 loops on two projectors with the frame succession of red-green-blue-red on one and cyan-magenta-yellow-cyan on the other projector – the two projections interleave and variate in size, frameline and speed. In addition, Jan Slak brilliantly performs with base drum and snares, seemingly synched with the projection. 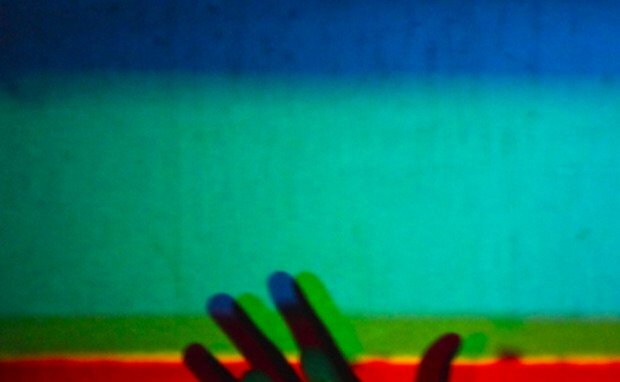 This audio-visual performance explores the basics of color film and perception, similar to the works of Paul Sharits, it makes use of the primary colors of the additive and subtractive color film system. A transcendent analogue experience, physical, radical, handmade, and live. Guillaume Cailleau is an active member of the collective LaborBerlin, devoted to preserving and developing the creative possibilities of the celluloid film format and DIY processing. He is an active member of Hanna’s Atelier for Sonorous Arts Ljubljana (Slovenia), which is an institution promoting and researching sound based art forms. He also operates in duo with the musician Werner Dafeldecker and with several choreographers and performers, creating video for the stage encompassing film, installations, video and performance which explode the boundaries of the cinematic image. Cailleau’s work has been shown internationally, at Centre Pompidou, Royal Ontario Museum Toronto, Haus der Kulturen der Welt Berlin, and at the International Film Festivals in Berlin, New York and Rotterdam, and at the Shortfilm Festival in Oberhausen. Jan Slak is an active presence in the Berlin music scene, switching repertoire from punk rock to jazz bands, and creating new work with multimedia artists for theatre and installations. Karolina Raczynski is a filmmaker and multimedia artist who actively curates and stages screenings and live exhibitions as part of the quartet Collective-iz in London and around the UK. Working outside the conventional cinematic space, Collective-iz, together and individually, explore the materiality of film and video, new technologies and the relationship between the screen and the audience. Raczynski explores the role of the screen by using video, film, Internet, public intervention, sound and performance. Her work attempts to move beyond the single screen setup and instead emphasises the perception of the projection as an event or a physical experience. She is interested in how the audience receive and respond to these events. Previous live works have included mirror signalling with her twin sister between Berlin and London, and other interventional pranks involving the audience members.